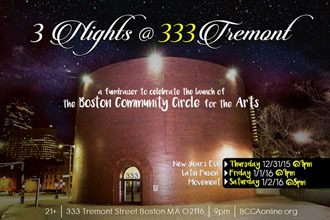 "3 Nights @ 333 Tremont"
§ ONLINE TICKETS & DONATIONS AVAILABLE 24/7! § AT THE DOOR: Tickets will also be sold at the door the day of the event, but we ask that you purchase them in advance, if possible! ** Discounted Admission: refers to our $10 discount for members, seniors, students, Bay Village residents, city officials/employees, verterans, BDA & StageSource members, and arts & labor unions (SAG-AFTRA, IATSE, DGA, WGA, AEA, etc.). 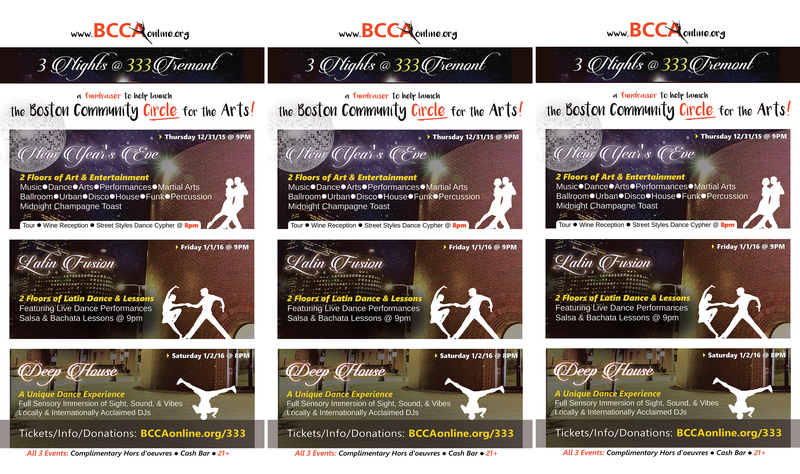 § BCCA, Inc. is a 501(c)(3) tax-exempt organization. § After completing your order, click to receive an E-Mail receipt. Please bring a copy with you to the first session. § This purchase is non-refundable unless an event is cancelled. § For security purposes, BCCA, Inc. does not keep credit card information on file. A full sensory immersion of sight, sound, taste, and texture, throughout the holiday weekend. * General admission: $75; Complementary hors d'oeuvres; Complimentary champagne toast; Cash bar. * 8pm - 9pm: VIP reception with complimentary cocktail & wine tasting and a private tour of classes, music & media studios, live DJ and music production demos (for community residents and city officials/employees, or those who donate at least $25 beyond general admission). Function Hall: Immersive Disco, House, & Funk music for dancingby DJs Dusty Digital & Kranz, a Breakdance battle, and a live showcase by acclaimed performer & producer Chas Bronz! Performance Hall: Ballroom music for dancing, Ballroom showcase, modern & urban art show by Percy Fortini-Wright & Rekloos, live painting, Martial Arts by Hung Gar Boston, Jazz & Samurai Taiko Drumming fusion by the Grandmaster Tsuji & the Samurai Academy of Kobudo, tehcnology showcase, and more! * Enjoy 2 floors of Latin dance music by renowned DJs Hernan & D. Martinez (complimentary Salsa & Bachata lessons at 9pm by Dan Marshall & Nina El-Badry (all levels; no partner needed), Latin dance showcases, and close-up magic by Rogue (of America's Got Talent fame). * General Admission: $25; Complementary hors d'oeuvres; Cash bar. * Dance to Deep House by acclaimed DJs Smeed & Suspence, Erlon, Mr. Don, and Andrew & Gallagher. The event will be streaming on Beatport Live and we will feature amazing close-up magic by Rogue. $10 off for members, seniors, students, Bay Village residents, city officials/employees, verterans, BDA & StageSource members, and arts & labor unions (SAG-AFTRA, IATSE, DGA, WGA, AEA, etc.). Tickets sold online (via the form on the left) and at the door. Advanced purchases encouraged. 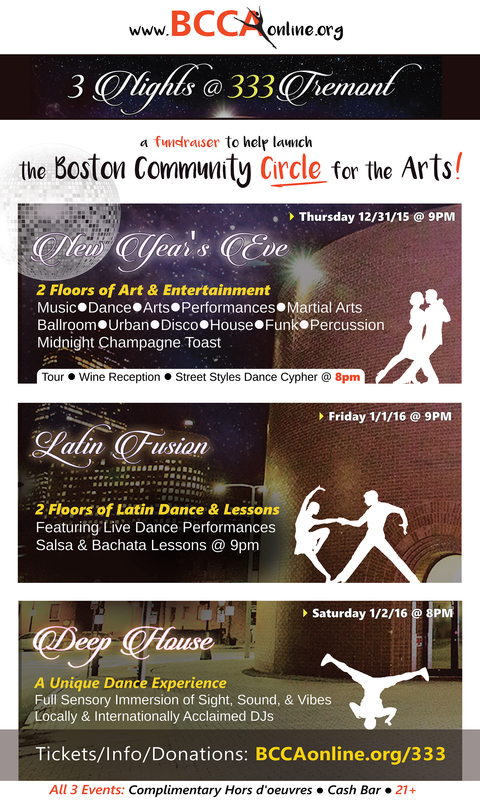 Copyright © 2002-2016 Brookline Community Center for the Arts, Inc. (BCCA, Inc.). All rights reserved.